Marc has an interesting post below about the "Stop Snitching" campaign. Judge Huck sentenced a very high profile cooperating witness this week, Jack Abramoff. 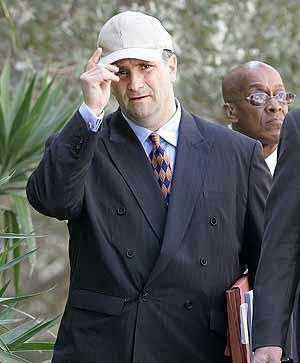 We previously posted on Jack Abramoff's different hats. Here is the one he wore for Wednesday's sentencing hearing (it looks like the same one he wore at his guilty plea). Those familiar with the Southern District will recognize one of the friendlier court security officers standing in the background of the picture. What I find much more interesting than all the hoopla about the hats is the 60 page memo (and 260 letters) that his lawyers filed in support of his request for a low-end of the guideline sentence, which TalkLeft praised as creative lawyering. Professor Berman over at Sentencing Law & Policy has an interesting post about the USA Today article on the anti-snitching campaign. This, of course, is a topic of great significance in the Southern District of Florida, and we hope this post results in some interesting dialogue. Whatever its intent, the Stop Snitching movement has galvanized officials already apoplectic about witness reluctance and witness intimidation.... Stop Snitching T-shirts have been banned from a number of courthouses. Boston Mayor Thomas Menino, whose city recorded the most homicides in a decade last year, threatened to send police into stores to pull them off the shelves. Following the furor over the Stop Snitchin' DVD, Maryland raised witness intimidation from a misdemeanor to a felony, and Baltimore police made a tape of their own, Keep Talking. "People have to snitch," says Peter Moskos, a former Baltimore street cop. Jack Abramoff and his former partner Adam Kidan were sentenced by the Hon. Paul C. Huck to five years and ten months, the low end of the federal sentencing guidelines. Both men were ordered to pay restitution in the amount of 21 million dollars. Abramoff will likely see that sentenced reduced as he continues to cooperate with the Government regarding alleged corruption by members of Congress. William Rodriguez-Abadia, the son of Miguel Rodriguez Orejuela and the nephew of Gilberto Rodriguez Orejuela,* was sentenced to 262 months by the Hon. Federico Moreno. At the sentencing hearing, Rodriguez-Abadia informed the Court that he will cooperate against his family. In light of his cooperation, the Government stated that they will likely file a Rule 35 to reduce Rodriguez-Abadia's sentence. *Disclosure -- David Markus is lead counsel for Gilberto Rodriguez-Orejuela. After six weeks of trial and seven days of deliberations, I'm very excited to post that my client (and four of the other 9 defendants) were found not guilty today. What an unbelievable feeling. Many people wonder why criminal defense lawyers do what they do. There is no better feeling in the world than hearing those two magical words. Nothing better. I salute the lawyers I was honored to work with in this case. Roy Black, Maria Neyra, Jackie Perzek, Jared Lopez, Alex Zipperrer, John Ossick, Tom Withers, Nate Diamond, George Vila, John Howes, Scott Srebnick, Hy Shapiro, and Ed Tolley. The prosecutors -- Jim Durham, Fred Kramer, Joe Newman, and Jeff Buerstette -- were gentlemen and excellent lawyers. Judge Edenfield ran a tight ship and made what could have been a 4 month trial a six week trial. His staff was also great. I knew we'd get a verdict today because my wife and new baby hopped on a plane at 12:30 to come visit me in Savannah. We got the verdict at 12:35... No joke. What an experience. More to follow. ... since we are on day 7 of deliberations. Jay Weaver reports on the government bugging of the FIU couple here. Very interesting article. Here's the intro: "Federal agents planted a bug in the bedroom of a Florida International University a couple of years ago, netting evidence to charge them as unregistered agents for the Cuban government, according to court records. The FBI also wiretapped the home phones of Professor Carlos Alvarez and his counselor wife, Elsa Alvarez, from at least late 2001 until last summer, collecting electronic evidence on practically all of their conversations. The reams of intercepts included mundane exchanges and even the private musings between husband and wife." Here is the defense motion on the issue and the government's brief as well. Also, Jack Abramoff will be sentenced today. Brian Tannebaum blogs about it here and here. "MIAMI (AP) -- The federal judge overseeing the terrorism case against Jose Padilla imposed tight restrictions Tuesday on the handling of classified material to prevent disclosure of national security secrets when classified evidence is turned over to the defense." p.s. We're in day six of deliberations. Miserable. U.S. District Judge Marcia Cooke in Miami is expected Tuesday to consider an unusual motion by prosecutors in the terrorism case against Jose Padilla and two of his alleged accomplices to prevent the defendants from seeing classified information the government may use against them. Although a government spokeswoman declined comment, defense attorneys said the motion shows that prosecutors plan to use classified materials in the upcoming trial of Padilla, Adham Amin Hassoun and Kifah Wael Jayyousi and wants to prevent the defendants from seeing such evidence. The trial is now scheduled for September. The three men, along with two others who are not in custody, are charged with conspiracy to murder, kidnap and maim persons in a foreign country and with providing material support to terrorists. In his motion, filed last month, Assistant U.S. Attorney Russell R. Killinger invoked the federal Classified Information Procedures Act. Judge Henry Leyte-Vidal has passed away yesterday. He died during the night while at Mt. Sinai hospital on Miami Beach. He was operated earlier this week for cancer. He has previously battled a brain tumor, skin cancer and I believe lung cancer. Henry came out of the operation OK but complained of some pain on Friday. The doctors were going to go back in but couldn't since he had low blood pressure (Could've been high, he suffered from one of these two). Since the doctors were unable to stabilize his blood pressure, they were unable to go back in. He then suffered cardiac arrest. and was placed back in ICU. This was all yesterday . Last night, He seemed to have stabilized when he died. Peter Heller just called me so I am passing it on to you. Peter was very close to Henry. They coached Little League together and Peter was with his son Danny throughout the day. Danny is 14yrs old. Judge Leyte-Vidal is also survived by two older sons Alex and Henrique or Enrique from an earlier marriage. ...than having a jury out deliberating? In the spirit of keeping the blog alive and kicking while I'm suffering in Savannah, I've invited Rumpole (yes, the Anonymous State Court Blogger) to guest blog. Enjoy. COMMENT #2 My response to the Editor is simply this: anyone listening to the tape will agree that the DBR misconstrued my remarks in a sloppy and disingenuous fashion just to create an attention-grabbing opening. This made for such a confusing introduction that the DBR felt obliged in the third paragraph to notify the reader that I was actually defending the Bush administration during the debate. The Editor's response likewise selectively quotes my statements in order to downplay my defense of the administration's actions. STEPHANOPOULOS: You know, if the president did break the law or circumvent the law, whatâ€™s the remedy? SPECTER: Well, the remedy could be a variety of things. A president - and Iâ€™m not suggesting remotely that thereâ€™s any basis, but youâ€™re asking, really, theory, whatâ€™s the remedy? Impeachment is a remedy. After impeachment, you could have a criminal prosecution, but the principal remedy, George, under our society is to pay a political price. You know what the headline was the next day in the LA Times? You guessed it: Arlen Specter: "Impeachment is a remedy"
The Herald reports here regarding Judge Moore's decision to impose the statutory-maximum sentence in an smuggling case that resulted in the death of a young boy. Editor’s reply: The article prominently noted that Jimenez defended the warrantless eavesdropping program and quoted him saying that the president’s conduct is “plausible and defendable.” It also explained that Jimenez was responding to a question about the appropriate penalty if the Bush administration went too far. The piece quoted Jimenez’s exact language that if the spying program monitored purely domestic communications, “the remedy if he exceeds his authority is impeachment.” The full nature and scope of the monitoring program has not been disclosed. A couple days ago the American Constitution Society held a debate between former U.S. Attorney Marcos Jimenez and Neal Sonnett regarding NSA's warrantless wiretapping. The Daily Business Review ran an article (by Julie Kay) on the debate, highlighting Mr. Jimenez's answers to questions (by Richard Rosenthal) about what remedy there should be if the President violated the Constitution. The article reported that Mr. Jimenez responded that impeachment would be appropriate. Mr. Jimenez has called the article misleading and has asked that his letter in response to the Daily Business Review editor be posted on the blog. So here it is. I'd like to thank Mr. Jimenez for making this letter available to the blog for posting. I would also invite Julie Kay and Richard Rosenthal to respond to this letter, as well as anyone else who was at the event. (Disclosure -- I am on the board of ACS and helped to plan the debate... Unfortunately I wasn't able to attend as I'm still stuck in Savannah). "David Markus has asked me to comment on the controversy surrounding a recent Daily Business Review article by reporter Julie Kay. Ms.Kay's article concerns comments made at the American Constitution Society's recent debate on the Bush Administration's NSA wiretapping program. One of the panelists in the ACS event, former U.S. Attorney Marcos Jimenez, now states that Ms. Kay's article misleadingly takes out of context some of Mr. Jimenez's answers to questions I posed to him. Because Ms. Kay audiotaped the entirety of the program, there is little that my own memory of the event could possibly add here. The recording will speak for itself. Perhaps an impartial third party would want to review the recording to make an independent assessment of Mr. Jimenez's present assertion. But -- as the ViceChair of the organization sponsoring the event, and as the person whoposed the rather pointed questions to Mr. Jimenez in the first place -- I am probably ill-suited to serve such a role. I would add only that I have the highest professional regard for Ms. Kay's journalistic abilitites and ethics, and equally high regard for Mr.Jimenez's legal abilities and ethics. I thank both of them for their presence and respective roles at the ACS event." The U.S. government tried to extradite a man to the Dominican Republic. He waited in the FDC in Miami for 8 months fighting it, claiming the DR was lying and fabricating evidence to secure the extradition. Guy Lewis and Mike Tein convinced Magistrate JudgeBarry Garber that the extradition was based on false testimony. Unbelievable. Here's the Herald story which was emailed to me. The Hon. Adalberto Jordan spoke at the Federal Bar Association’s luncheon yesterday. Judge Jordan explained that attorneys must inform the public of the importance of the judicial “process” and to avoid the tendency to focus solely on the end result of a judicial decision. Judge Jordan emphasized that the public needs to become more aware that a judge’s ruling is based on rules, procedures, precedent, statutory interpretation and legislative history. He specifically pointed out how media pundits talk about impeaching judges because of “lenient” decisions in criminal cases or argue about how a newly appointed Supreme Court justice may rule on a particular issue, thereby politicizing the judicial process, and that this endangers the public’s perception of the judiciary. He offered as an example the recent decision by Judge Moreno involving the fifteen Cuban refugees who arrived at the old Seven Mile Bridge. The media focused on the end result and whether Cuba would allow these refugees to return to the United States rather than on the “process” of how Judge Moreno reached his decision. Judge Jordan requested that all of us inform our loved ones, neighbors, and colleagues that judicial decisions involve more than just final decisions but a process that protects the integrity of our legal system. ... next year may we be free men. That's how Passover Sedar is concluded. Howard Srebnick has a great quote playing off of that line for his new client, alleged Israeli crime boss Ze'ev Rosenstein: "This year a prisoner in Miami; next year a free man in Israel." U.S. Attorney Alex Acosta responds: "By prosecuting these cartels and the heads of these cartels, in one strike we clean up the streets." The case is in front of Judge Dimitroleous in Ft. Lauderdale. Here's some coverage of the case. As for Savannah, we are having court this Saturday... No kidding. So I again apologize for the really slow blogging. One is from the Miami Herald about Jack Abramoff's sentencing. Despite the joint motion to continue the sentencing for at least 90 days, Judge Huck only gave a two week continuance until March 29. Then there's Julie Kay's article in the DBR today about the feud between Judges Hurley and Zloch regarding the Broward courthouse and splitting the District. Here's the intro: District Judge Daniel T.K. Hurley is urging the Broward legal community to forget about establishing a new federal judicial district consisting of Broward and Palm Beach counties and to instead fight hard to keep a federal courthouse in Broward.Hurley, speaking to the Federal Bar Association’s Broward chapter late last month also disclosed for the first time that Southern District of Florida Chief Judge William J. Zloch kept his plan to close the federal courthouse in Fort Lauderdale secret for a full year.Hurley also said Zloch’s plan was approved by South Florida’s federal judges by a single vote and that Zloch never told judges the results of a second vote on the issue.Zloch, who does not talk to reporters, did not return a call for comment.In a December 2004 letter to the Judicial Conference of the United States first reported by the Daily Business Review on Jan. 12, 2005, Zloch laid out a plan to save more than $100 million by, among other things, consolidating court services now performed in Fort Lauderdale, West Palm Beach and Miami. Zloch suggested that a new courthouse long proposed for downtown Fort Lauderdale instead be built in West Palm Beach.Zloch also proposed consolidating budget administration services, procurement, personnel computer services functions, and the intake functions of the district and bankruptcy courts.After Zloch’s plan was disclosed by the Review, it was torpedoed by South Florida members of Congress, local elected officials and community leaders. Instead, plans are under way for a combination state and federal judicial complex in downtown Fort Lauderdale.Last May, Hurley took the unusual step of meeting with newspaper editors to denounce Zloch’s “clandestine” effort to close the courthouse. In doing so, he won the gratitude of Fort Lauderdale lawyers, who would have had to commute to Miami or West Palm Beach to conduct their federal practice.“He is a hero to us,” Fort Lauderdale lawyer Terrence Russell, a partner at Ruden McClosky and former Florida Bar president, said after Hurley’s talk at the Federal Bar’s meeting late last month. Thanks for Marc Seitles for his posting. Interesting piece in the Congressional Quarterly Today about James "mandatory minimum" Sensenbrenner, the Chair of the House Judiciary Committee. Apparently, Mr. Sensenbrenner and others on this important committee believe that mandatory minimum sentences are unduly harsh and unfair. Well, not really. Nevertheless, Mr. Sensenbrenner has "agreed to strip many of the mandatory minimum sentences aimed at curbing street gangs and violence against judges from legislation that the House is likely to consider this week." The blog Sentencing Law and Policy discusses the recent article and has an interesting series entitled "Dead Booker Walking." Check it out. It looks like the controversy of secret dockets is becoming part of the federal judicial landscape. Jurist.law.pitt.edu has an interesting article on the issue and explains that there has been a “sharp increase” in secret proceedings in U.S. federal courts. More than five thousand criminal defendants have had their case records sealed, that is more than five times the number from 2003. Hidden federal dockets, where the existence of the case is not disclosed, is also on the rise. Interestingly, as many readers already know, the Eleventh Circuit ruled that secret dockets were unconstitutional in United States v. Ochoa. Are secret dockets the trend of the future? Florida Trend has an article about Florida legal blogs by Cynthia Barnett and mentions SDFLA. Magistrate Judge Hugh J. Morgan announced his retirement today. Judge Morgan has served six terms and has been on the bench for almost 25 years. He was the only magistrate to sit in the Florida Keys thus raising questions about whether he will be replaced or the part-time mag position in Key West will be gone forever. Anyone with inside information on what will likely happen feel free to comment. Judge Moreno issued a landmark decision finding that 15 repatriated Cubans were removed to Cuba illegally insofar as the Coast Guard's decision to remove the refugees "was not a reasonable interpretation of present executive policy." This case highlights the debate about the "wet-foot, dry-foot policy" that allows Cubans to remain in the United States if they reach land. Cuban refugees had reached the old, unused Seven Mile Bridge but the Coast Guard determined that the bridge had been abandoned and that the Cuban refugees had not reached dry land in the United States. Judge Moreno disagreed.